The video is horrifying. 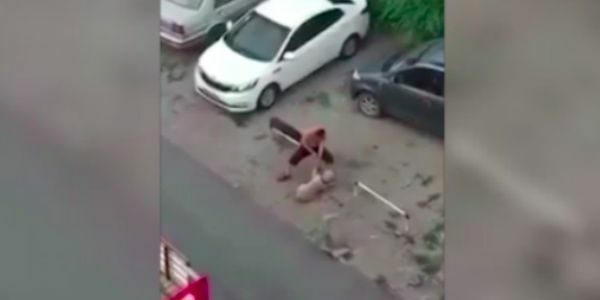 A man in Jilin, China repeatedly punches his dog as the dog wails in pain. It's devastating to watch, but at least with footage, the man will be identified and apprehended quickly, right? Wrong. That's because China has no law to punish those who abuse domestic animals unless they are pets owned by another private party. Sign this petition now to change that. It turns out, this isn't the first dog this man has abused. In another video, the man beats a dog with a stick after tying it to a metal rail. According to neighbors who have caught these acts of cruelty on video, he has a history of torturing his dogs in public so that passersby will get upset and offer to buy the dogs. The dog in the video above was purchased for 3,500 RMB (£391) in order to stop the suffering. If China had stricter animal cruelty laws, this intentional abuse could be stopped. And it looks like there's a growing movement in China that supports ending animal abuse. In recent years, public outrage in China about high-profile animal abuse cases has put pressure on the government to consider animal cruelty laws. There's also a growing number of animal welfare organizations forming in China. The people have spoken, and they want animal abusers held accountable. Please sign this petition to put pressure on the government in China to strengthen the country's animal cruelty laws now.